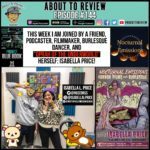 ATR #144 – Project Blue Book and Isabella Price! I was joined this week by the "Oprah of the Underworld" herself, the one and only Isabella Price! We discuss the new History channel show "Project Blue Book" & then find out about Isabella's favorite horror films in preparation for you her new series!